For thousands of years, ginger has been prized for its medicinal effects, and sipping on ginger tea can provide relief from some uncomfortable conditions. 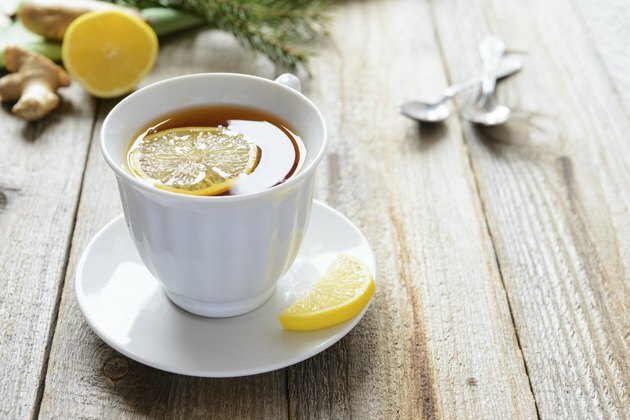 For the full effect, brew your own tea by simmering fresh ginger in water, or look for packaged teas that contain ginger as the main ingredient rather than those containing traditional tea with some ginger flavor. As healthy as ginger tea may be, speak to your doctor before relying on it to treat any medical condition. One of ginger's greatest claims to fame is its ability to fight nausea, and drinking ginger tea may help settle your stomach when you feel ill. Multiple studies suggest that ginger helps relieve motion sickness and morning sickness, as well as nausea induced by chemotherapy or surgery, according to the University of Maryland Medical Center. Not all studies agree, however, so this treatment may not work for everyone in all stomach-churning situations. Ginger has anti-inflammatory properties and thus may help relieve muscle soreness after exercise, according to a study published in "The Journal of Pain" in 2010. Subjects participated in weight-training exercise to induce muscle pain and were then given either raw ginger, heated ginger or a placebo. Researchers observed pain intensity over the following three days and found that participants who took raw or heated ginger experienced less pain than those who took the placebo. Therefore, drinking ginger tea after tough workouts may help you cope with exercise-related muscle soreness. Women who experience heavy menstrual cramps may find relief with ginger tea. In a study published in "BMC Complementary and Alternative Medicine" in 2012, researchers followed 120 students who had dysmenorrhea, which is characterized by painful cramping in the abdomen or back during periods. Subjects were given either ginger or a placebo three times per day and reported their pain level and duration during menstruation. Those who took ginger experienced less pain than those taking a placebo, and the pain did not last as long for the ginger group. Side effects are rare, but drinking too much ginger tea may cause unpleasant reactions such as oral irritation, heartburn or diarrhea. While no official dosing instructions exist for ginger tea, you should cut back or stop drinking it if you experience these effects. The University of Maryland Medical Center also recommends speaking to your doctor before taking ginger if you have gallstones, diabetes or heart disease. In addition, ginger may not be safe if you have a bleeding disorder or take blood-thinning drugs.